A regional publisher has continued the roll-out of its new-look websites branded in line with its newspapers. Local World launched the first seven new sites last month with URLs that correspond to their print companions. 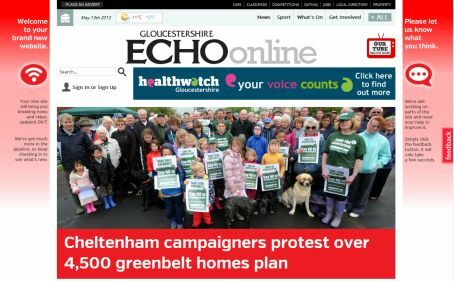 A number of further titles have seen their sites relaunched this month, including the Leicester Mercury, South Wales Evening Post, Stoke Sentinel and Gloucestershire Echo. The sites are designed to have a more tabloid appearance with an uncluttered style and Local World plans that much of the content on them will eventually be user-generated. An internal announcement about the sites said: “The new websites have a different look, with an uncluttered style that leads straight to the local stories that matter. “They are more ‘tabloid’ in feel, meeting the demand for easy to read, visual and high impact content with a greater emphasis on local people. “As they develop they will also have a greater range of news content which will be more fluid and dynamic than before, with updates throughout the day. “While print and digital brands are being aligned, their content will become far more starkly differentiated. In particular, the digital platforms will include a far wider range of content sources, especially user generated material. The new-look sites include those of the Torquay Herald Express, Mid Devon Gazette, Llanelli Star, Carmarthen Journal, Lichfield Mercury, Sutton Coldfield Observer, Walsall Advertiser, Tamworth Herald and Plymouth’s The Herald. The full roll-out of more than 80 Local World sites due to be complete by the summer. They look awful. More user-generated content? Whoop-de-do. So let me get this straight: at the moment, if you don’t know the name of the local paper, you type in, say, Thisisexeter and lo and behold, you’e there. Simples. Under the new system, you’ll have to google it before heading for the site. Unless of course you happen to see other papers covering the same area (anyone for the Exeter Daily?) and head there instead. Jolly kind of Local World to give the opposition a leg-up, I say. Websites don’t need great big tabloid headlines. You have to scroll across and even down the screen just to read them! That is stupid and uncomfortable. It’s not size that matters – it’s content. These sites really are dire – far worse than what they replace. Big headlines really don’t work on screen; they just stop you scanning easily for items of interest. Anyone nostalgic for white space should use Firefox or Chrome with Adblock Plus to get rid of the clutter. I think your being a bit picky. Most people know the name of their local paper and the whole point of the re-brand is that the current ‘thisis’ brand was not making the most of the trusted nature of local press & the local brands that had been built up over decades. At times when I was down the local football team, you would see the brands competing against each other – not great for consitancy! The sites themselfs are awful though & look like a 2 year old desgined them.